100% polyester, exclusive of trimmings. glasses, shirt, tie ,jumper and shoes. Hand wash cold water.Do not bleach.Dry flat.Do not iron. 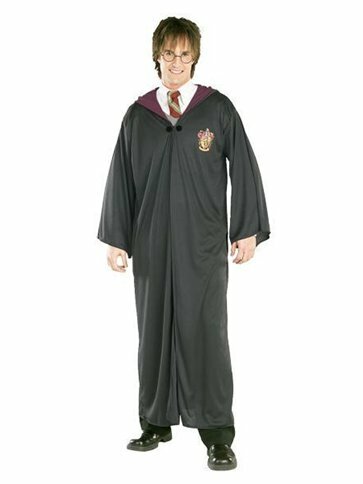 Become a brave and courageous wizard and join the house of Gryffindor with our licensed, full length, black gown with burgundy, lined, pointed hood and Gryffindor house badge print to chest. This easy to wear gown fastens with a fabric covered clasp and has been hem finished throughout for longer lasting use, a perfect costume for halloween, movie themed occasions or ideal for any fancy dress party.